Many of us care for others but don’t realize we are caregivers. We think it’s our job or role as a parent, child, spouse, doctor, nurse, social worker, home health aide, therapist, teacher, manager, employer, you name it. But the giving our time, efforts and ourselves can be draining. How we care for ourselves while caring for others is often overlooked and something we all need to pay attention to, caregiver or not. Caregivers who are paid for their efforts may think their work is done when they head home. But many of us go home to care for children, parents or other loved ones. One thing is common among caregivers: they typically put their own needs last. This may be a noble or loving gesture, but often it’s done out of a sense of duty, lack of resources or just not enough hours in the day. 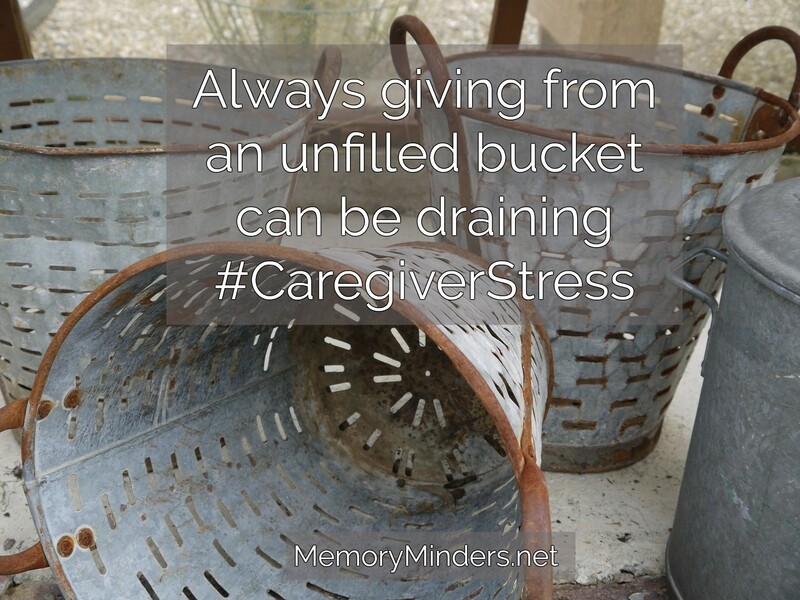 Whatever the reason, the practice of always putting others first as a caregiver causes undue stress. Caregiver stress is a growing national problem, one that is responsible for illness, depression and financial burden. Caregiver stress begins to manifest in many ways: increased irritability, lack of interest in life, high blood pressure, headaches, weight gain or shallow breathing which can all eventually lead to further health issues. When the caregiver is ill, it creates even more stress not only on them but also who they are caring for-it’s a vicious cycle. Today and next week, I’ll provide tips on how to deal with the stress that comes from helping others. It’s a growing issue in our communities and the sooner we address it, the sooner we improve everyone’s quality of life. Take a breath-literally and figuratively. I remember having young children, starting MemoryMinders and also caring for ill loved ones. I didn’t have time for a haircut, let alone consistently exercise, cook healthy meals or do something for myself. Sometimes, all I could do was take a deep breath. In those deep breath moments, I often prayed and found what I needed to move on. Taking time for ourselves is crucial, but those moments can be elusive. A deep breath, a few minutes of fresh air or even being in the bathroom alone can be rejuvenating. Take a moment (or two if possible) for yourself. Regroup, pray, calm yourself and breathe-you will put more oxygen into your body and brain to think and act clearly. Do it for yourself and those you care for. Assess your system(s). As we care for others, or even just ourselves, we develop certain ways of doing things, honed over time or necessity. But as life changes so must our way of doing things. The same way is not always the best way and different is not always a bad thing. Fresh eyes can often bring new and needed perspective. But change is difficult, especially as we get older. Embrace change in a positive manner and over time if necessary. It may involve letting go of some patterns, people or projects to add new or needed change. Caring for others is a joy for many of us. We see it as our life’s work and/or a precious season of life. But always giving from an unfilled bucket will eventually leave us drained. 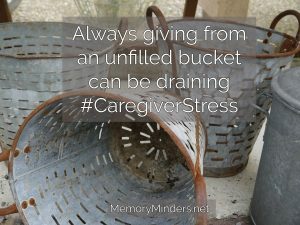 [tweetthis]Always giving from an unfilled bucket can leave us drained [/tweetthis] Stay tuned for next week’s continuation of the importance of self-care. We are only given one life to live. Let’s make all our moments memorable not only for ourselves but those we care for as well.